If you like your beach escapes rugged and untamed, then you’ll feel right at home along Oregon’s Wild Rivers Coast, which extends from Coos Bay through Bandon and Brookings to the California border. Less developed and populated than the state’s central and northern coasts, this meandering stretch of capes and boulder-strewn beaches appeals to nature lovers, wildlife watchers and trailblazers. Visiting the South Coast’s secluded sweep of laid-back towns feels like you’re in on a secret — even more so when you take the trip car-free, an easy endeavor when you start in Eugene. Pacific Crest Bus Lines buses depart daily in the late afternoon from the Eugene Amtrak Station to Coos Bay. (If you’re setting out from Portland, you can take Bolt Bus or Amtrak to Eugene.) The scenic ride west along Highway 126 to Florence and then south on U.S. 101 takes about 2.5 hours. From Coos Bay, Curry Public Transit’s Coastal Express offers weekday service, with three departures daily, south along coastal U.S. 101 to Brookings, with stops at several picturesque towns along the way, including Bandon, Port Orford and Gold Beach. 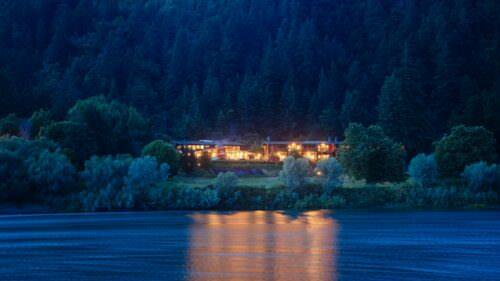 Give yourself at least three nights to make this trip. Spend the first in Coos Bay, another in Bandon or Port Orford, and your last night in Brookings. 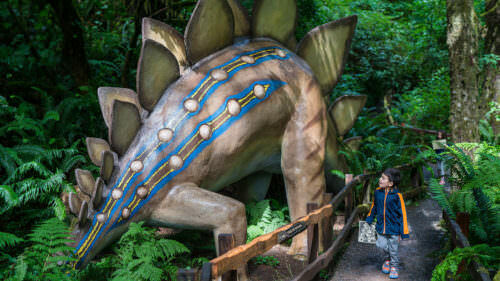 If you’re looking for a more in-depth experience, you can easily stretch out this adventure over a week without running out of engaging things to see and do. Extend your trip: The Pacific Crest bus stops in the artsy town of Florence on the way to Coos Bay. Budget a few extra days to explore the walkable city’s galleries, shops and seafood restaurants. Find ideas for a car-free Florence detour here. This small city on the largest natural harbor between San Francisco and Seattle has long been a hub of logging and timber milling. Coos Bay is also a popular jumping off point for exploring several noteworthy natural attractions, including the southern end of the Oregon Dunes National Recreation Area and the coastal Cape Arago Beach Loop, which comprises three spectacular state parks. 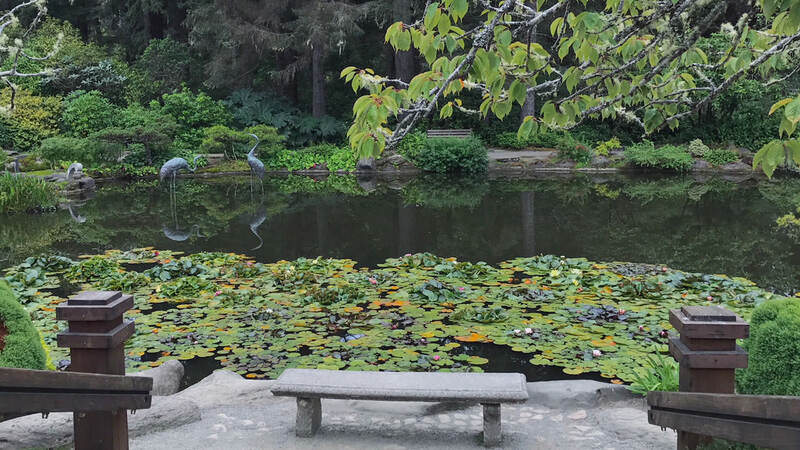 If you’re short on time, focus on Shore Acres State Park, a former lumber baron’s estate that sits atop dramatic sandstone cliffs and abounds with formal gardens. The flowers here burst with color from spring through fall, and holiday lights illuminate the grounds from Thanksgiving through New Year’s. Although you’ll need to take a taxi to visit nearby coastal sites, you can explore historic downtown Coos Bay on foot. Choose a central lodging option, such as the Best Western Holiday Hotel or the Red Lion Coos Bay, which offers its guests complimentary bike usage. Upon arriving in the early evening, dine at the romantic Blue Heron Bistro, which is known for hearty, well-crafted German fare, such as jagerschnitzel and hasenpfeffer (rabbit stew). Or catch a movie at the restored 1925 Egyptian Theatre, with its ornate interior and original Wurlitzer organ. If you’re hungry afterward, duck into Restaurant O, a lively bar and grill that’s open until 10 p.m. and serves charcuterie and cheese boards and other light tapas, as well as more substantial fare, like oak-and-herb-smoked chateaubriand. The next morning, stroll along the 5-mile harborside boardwalk and promenade, stopping at the outstanding Coos History Museum & Maritime Collection, which occupies a stunning contemporary building with imaginative exhibits on logging, shipbuilding and maritime history. 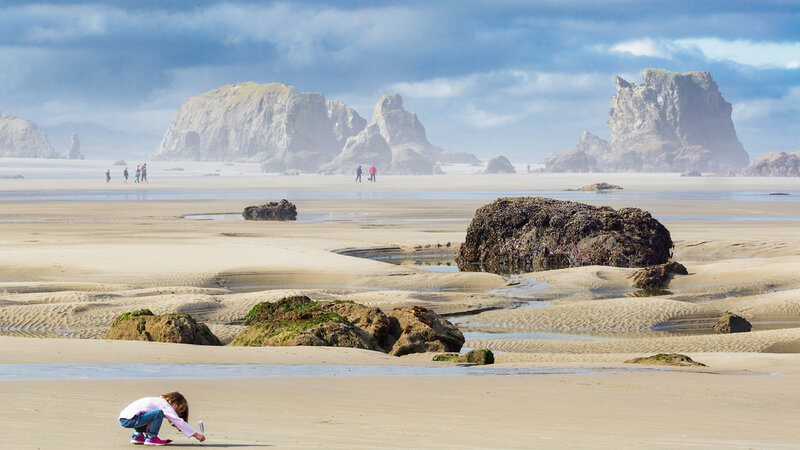 With a vibrant arts scene, spectacular beaches and coastal rock formations, plus three of Golf Digest’s 10 top-ranked public U.S. golf courses, Bandon is one of Oregon’s most storied coastal communities. The compact Old Town district is perfect for strolling among cafes and galleries, and South Coast Bicycles — a few blocks from the bus stop at Ray’s Food Place — rents fat-tire bikes, which you can pedal on the trails and sandy shores at Bullards Beach State Park and Face Rock State Scenic Viewpoint. Feast on local oysters on the half shell and Dungeness crab melts at casual Tony’s Crab Shack or on exquisitely presented farm-to-table fare while overlooking the Coquille River at The Loft Restaurant & Bar. A good close-in lodging option, the Bandon Inn — named the #2 Best Fan-Favorite Destination in Oregon for 2019 —sits atop a bluff overlooking Old Town. Or if you wish to test your mettle at legendary Bandon Dunes, this iconic golf resort 5 miles north of town offers free shuttle service around its expansive property and can assist you with off-property transportation. There’s no need to bring your clubs, either — the pro shop rents them for $60 per day. Tiny and impossibly pretty Port Orford, the westernmost incorporated town in the lower 48 states, makes an excellent base for fishing, hiking and whale watching; keep an eye out for gray whales, which are especially present during the late March and late December through early January migrations. About five blocks south of the bus stop at Ray’s Food Place, Pineapple Express Adventure Rides rents fat-tire bikes and offers full- and half-day guided bike tours. Avid trekkers could easily spend a day or two here on the trails at centrally located Port Orford Heads State Park, or climbing the 6-mile loop trail to the eponymous 1,756-foot peak of Humbug Mountain State Park, a 40-minute bike ride from town. Port Orford has a few lodging options. With sweeping ocean views and a handy downtown setting, Castaway by the Sea motel is a reliable bet. 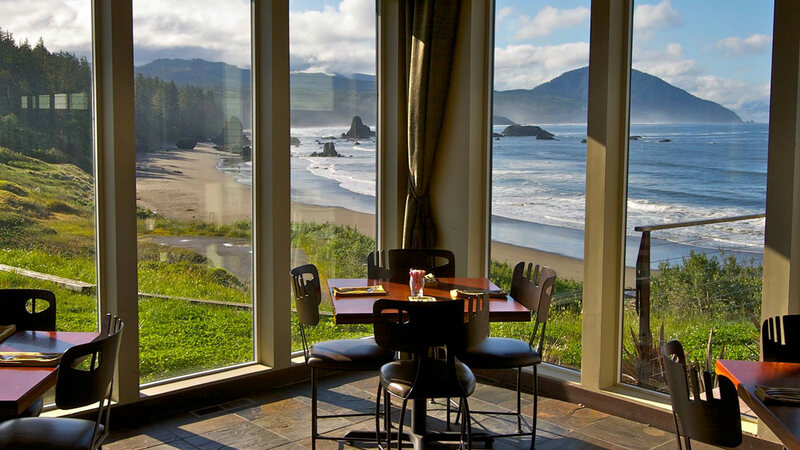 It’s a short walk from one of the most memorable dining experiences on the Oregon Coast, Redfish, which serves mod-French cuisine in an art-filled dining room with floor-to-ceiling windows overlooking the sea. Harris Beach State Park is home to tidepools, wildlife and photoworthy sea stacks. 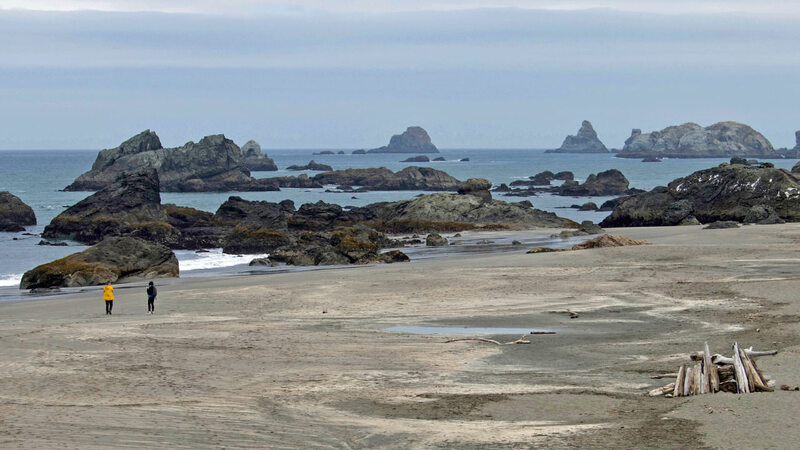 Welcome to Oregon’s “Banana Belt.” The Coast’s southernmost town, Brookings beckons with a mild climate and superb sportfishing, especially where the Chetco River meets the Pacific — and salmon and steelhead thrive. 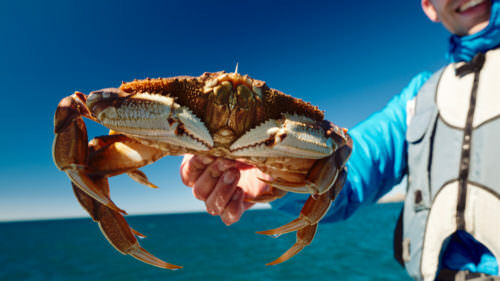 You can book a deep-sea or river fishing expedition through Tidewind Sportfishing and Brookings Fishing Charters, or rent tackle — as well as kayaks and stand-up paddleboards — at Riverside Market. Another key draw, Harris Beach State Park lies just over a mile up the coast from town and delights visitors with its colorful tide pools, forested hiking trails, and opportunities for spotting everything from whales and harbor seals to rare tufted puffins. End a day of adventuring with shrimp and grits or a cast-iron steak at Oxenfre Public House, or a pint of Block and Tackle Stout at Chetco Brewing Company. Just a 10-minute walk from the bus stop at Bankus Fountain (U.S. 101 and Fifth Street), the handsome Craftsman-style South Coast Inn B&B has four individually appointed rooms and two cottages; rates include a family-style gourmet breakfast. Or take a taxi 2 miles south to the Best Western Beachfront Inn, a contemporary three-story property with oceanfront rooms. Cab services — Tired of walking? Your car-sharing apps won’t work here on the Coast, though you can hail a number of reliable cab companies that service the area, including Yellow Cab and South Coast Taxi in Coos Bay and Accurate Taxi in Brookings. 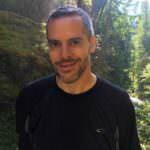 Bike travel — Planning on toting a bike along? Coastal Express buses along this route are equipped with bike racks, but Pacific Crest Bus Lines buses between Eugene and Coos Bay don’t accommodate bikes. 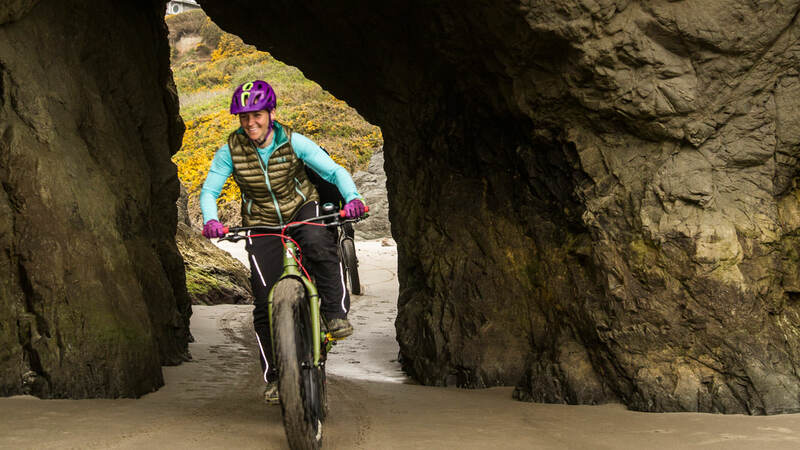 South Coast Bicycles in Bandon and Pineapple Express Adventure Rides in Port Orford both rent fat-tire bikes.